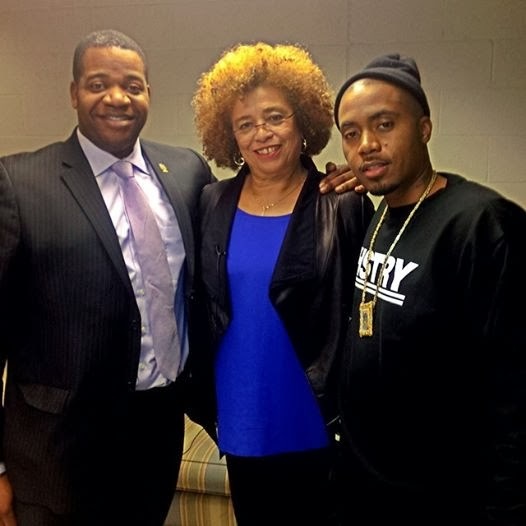 Last night Angela Davis and Nas visited Lehigh University in Bethlehem for a conversation about Civil Rights and justice for America's incarcerated population and their families. 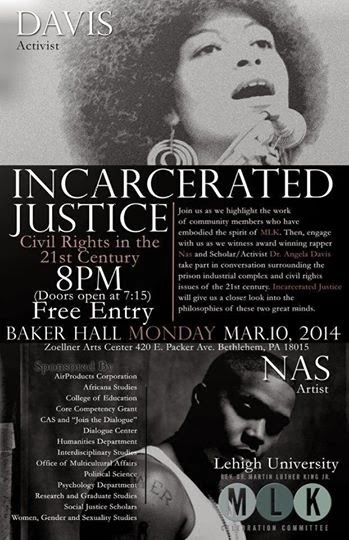 Lupe Fiasco was originally scheduled, but sorry, Lupe, this billing is better. Perhaps because I am so guarded when it comes to the strange bedfellows of Hip Hop and academia, I was pleasantly surprised how well it went. Much respect is given to the entire MLK committee for creating a well organized but relaxed atmosphere. Smartly, they played Nas' greatest hits over the loud speakers leading up to the event; such a necessary ingredient is sometimes missing at collegiate affairs like this. MLK Awards were given to students and faculty for definitive and identifiable contributions to the school and the community. Rousing performances of spoken word and singing preceded the main event. 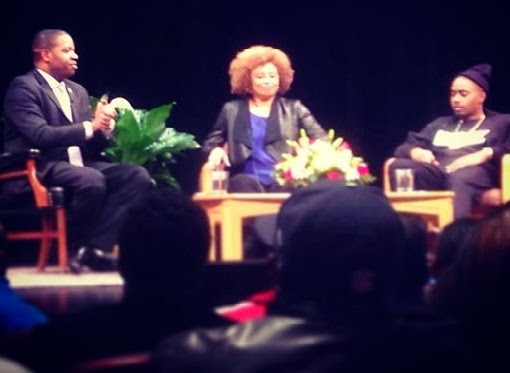 The at large Civil Rights conversation between Prof. Davis and Nas was loosely focused on the Prison Industrial Complex. Ms. Davis' career, her personal struggles and activism were obviously a compelling and instructional tale of overcome and the ongoing fight for justice. Expressing a sincere gratitude toward the crowd, she appeared to be still in awe of an audience of 700+ hanging on her every word. Her analysis and information were not breaking news but it was pointed in its indictments of the tragedy and farce that institutionalized racist private prison policies embody. And she was not without a few criticisms of the Ivory Tower. But the proceedings also felt safe rather than radical. Formal academic spaces have a way of doing that. Nas effectively employed his skill to relate complex social, cultural and personal experiences in pithy phrases or imagery. There were no cliches about "growing up in the 'hood" but rather he spoke frankly of his subjective experiences that he later learned in adulthood were a part of larger systemic dysfunction. My words not his, but to his credit he didn't try to be an academic and yet he seemed comfortable and humble on such a stage, insightful in his own way. Certain audience questions that came his way were the fantastic kind you might ask an oracle and he gave an honest answers to the best of his ability. 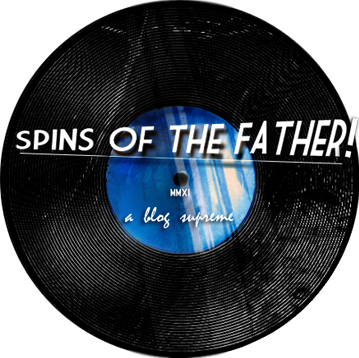 In his public persona he simultaneously conveys the affect of an old soul and a child at heart. 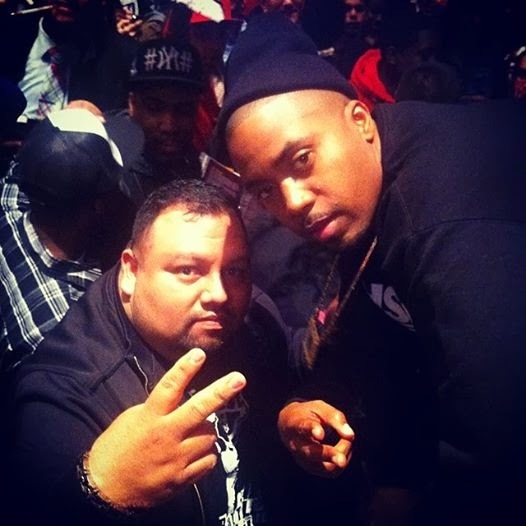 Nas successfully evaded questions about the objectionable lyrics of women and violence that pervade rap by distancing himself from the record industry and emphasizing he makes music for adults not for children to hear on the radio. A few of my feminist friends- and also hip hop heads who know his discography well- felt he was let off the hook. I mean, in this regard, perhaps someone could have asked just a two word question of him: "Oochiee Wally?" But that would have been a disingenuous "gotcha" moment if things had gone in that direction. That type of discourse was not what this particular evening was about. What was perhaps most impressive was that a very public, impromptu conversation about inequality, imprisonment and social action was held by two very different luminaries who were nonetheless kindred spirits. Their career arcs couldn't be more different but their politics the same. It was a bridged a gap between the Civil Rights movement and the Hip Hop culture industries, a sight rarely seen. The multi-generational nature of this event was reflected in the wide age range of the attendees as well. Professor Davis and Nas also did an excellent job connecting with audience members who asked questions, applauding student's thoughtfulness or their efforts to excel. This was likely doubly so earlier in the evening when a group of Lehigh students worked one on one with Davis and Nas in the classroom. Special shout out to Liberty High Students and Northampton County Community college students who showed up and came ready with questions. There was a discernible feeling of uplift throughout this event. Also acknowledgement must be given Dr. James B. Peterson. As a moderator, he was at ease out the gate and deftly lead discussions between these two different types of individuals. He never took any of the spotlight for himself, an important (and rare) talent reflecting his character, skill set and intelligence. For an event billed as a intimate conversation, Dr. Peterson made that possible by his laid back but confident demeanor. So props all around. It's time to build (schools) and destroy (prisons).